FRED DE SAM LAZARO: Aravind is the world’s largest eye care center, a one-stop shop that even makes many of the lenses and instruments used by its surgeons. It looks like any of India’s high tech centers where rich Indians and medical tourists can get first-world care at third-world prices. The surgical error rate is as low here as any place in America. The big difference at Aravind is that its patients are among the world’s poorest people. Twenty years ago, I visited Aravind’s founder, Dr. Govindappa Venkatswamy. Everybody called him Dr. V. He had retired from a government hospital in 1976 and set out to tackle “needless blindness.” Worldwide, 45 million people still suffer from preventable or reversible blindness. Twelve million are in India alone, where the extreme sun and a genetic predisposition are blamed. Many people lose their sight—and livelihood—by their early 50s. Dr. GOVINDAPPA VENKATASWAMY (Aravind Founder, speaking in 1988): There is nothing which disables a man more than cataract and poor eyesight, and there is nothing more easier than to mend it. You just do a small operation. DE SAM LAZARO: Dr. V began with a simple idea in a sparse 11-bed hospital with four doctors, three from his own family. It would serve patients who could pay, but the profits would afford free care to the many more people who couldn’t afford even the bus fare. So Aravind set out to find patients, mainly through screening camps in surrounding rural areas. For those needing surgery, groups like the Lions Club provided buses to the hospital, where they entered a brisk assembly line operating room. Dr. V’s business role model was the American chain store. Dr. VENKATASWAMY: In America you have models, whether it is Sears stores or McDonald’s hamburgers. You are able to open a chain of stores, restaurants, hotels, and you are able to organize them efficiently. Dr. ARAVIND SRINIVASAN (Aravind Hospital Administrator): You spoke to him here. You were sitting here, and he was sitting there and talking about McDonald’s. DE SAM LAZARO: Dr. V died in 2005, but his office is left untouched as a shrine to him. His nephew, ophthalmologist Aravind Srinivasan, manages a system that’s grown to five regional hospitals and 25 satellite clinics. This was the first one. Dr. ARAVIND: This is a 32-year-old hospital, so we are probably geared to see about 700 patients a day. Today we are seeing about 1500 to 2000 patients a day. DE SAM LAZARO: Each pays about one dollar for a doctor’s appointment. 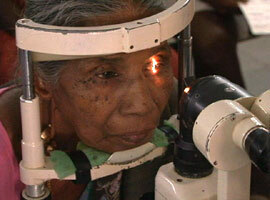 That helps fund an equal number of patients who go next door to a free eye hospital. There’s not much profit margin, so a heavy volume of paying patients—satisfied patients—is critical. Efficiency is also critical. Dr. ARAVIND: We call this a clinic scoring sheet. DE SAM LAZARO: Dr Aravind, who also has an MBA from the University of Michigan, has continuous productivity reports at his fingertips. Dr. ARAVIND: This statistic talks about service time, what percentage were seen within two hours. DE SAM LAZARO: Patients are promised a completed appointment in two hours. A brochure details what they can expect. Dr. ARAVIND: Registration takes about 5 minutes, vision test about 10 minutes, refraction check about 10 minutes. DE SAM LAZARO: This is sort of a patients bill of rights almost? Dr. ARAVIND: Exactly. So they understand what’s happening. DE SAM LAZARO: Aravind’s reputation is drawing patients from farther and farther away. K.G. ANGENEYULU (Aravind Patient/Voice of Translator): Whenever you say eye operations everyone says go to Madurai. DE SAM LAZARO: Fifty-five-year-old K.G. Angeneyulu had been in a three-year depression that started when cataracts began clouding his vision. He became completely blind three months ago. Angeneyulu and his wife Shobha endured a two-day train journey to get here. Mr. ANGENEYULU (Voice of Translator): I was a sportsman. I used to swim. After the cataract, I could no longer move around. I got stuck at home, and I started eating. Then a leg injury made me even more immobile. I had problems being overweight, and I developed high blood pressure. (to Dr. Aravind): So you’ve been going for two hours and done 16 surgeries? DE SAM LAZARO: Dr, Aravind and surgeons in several other operating theaters or OTs were first working the routine—mostly cataract—cases. Dr. ARAVIND: The other OTs are not primarily cataract surgeons. They are primarily doing either glaucoma or cornea, and they also do some cataract to contribute to the main volume, so we are able to identify those cases that need a little extra attention are segregated from the pool. DE SAM LAZARO: Angeneyulu was a high-risk case, given his hypertension and obesity. Dr. ARAVIND: You just have a margin is about five to10 minutes to get the surgery done. 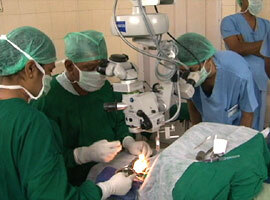 DE SAM LAZARO: About 10 nervous minutes later, Dr. Aravind had removed a particularly tough, leathery cataract. 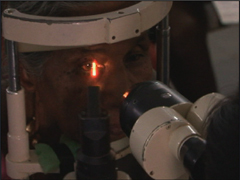 Dr. ARAVIND: The cataract was a little obstinate, but things went on well. He’ll get about 95 percent vision tomorrow, so when you see him tomorrow you’ll see a very different man—more confident. DE SAM LAZARO: By the end of this day, Dr. Aravind and his colleagues did about 300 surgeries, about half of them free of charge. Increasingly, however, patients are seen outside the hospital. Telemedicine connects doctors to satellite clinics, and today’s eye camps offer much more on site—from grinding eye glass lenses to digital scans. Near the camp a satellite truck beamed high resolution images to specialists at the hospital. Technology has improved care, and it has also brought down costs—notably for the intraocular lenses which are implanted during cataract surgery. They used to be imported. 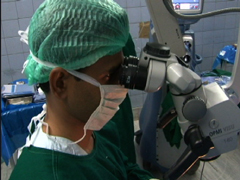 Aravind began making its own intraocular lenses back in the early 1990s. They used to cost between $50 and $100 each. Today they are made in this factory for as little as two dollars a piece. Aravind lenses are exported to 120 countries, and they own eight percent of the global market in intraocular lenses. This factory is an example of how Aravind turned a supply problem into an opportunity. 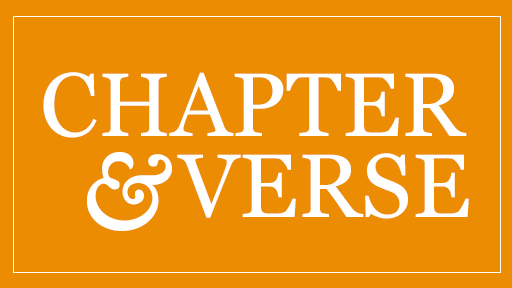 It’s not just business acumen that drives the mission, but also a firm spiritual basis, inspired by the teachings of Sri Aurobindo, a mid-20th century spiritual leader. He believed that good work and good ideas are a manifestation of the divine. R.D. THULASIRAJ (Aravind Executive): Part of that is to recognize that whatever ideas you get, it’s not really your ideas. They are divine ideas. So how do you kind of act on it but are not taking the egoistic ownership to those ideas, like “I have don it?” So how do you train yourself to open up? DE SAM LAZARO: One way Aravind has opened up, or shared its ideas, is by training some 250 hospitals in 40 nations to adopt its methods. Mr. THULASIRAJ: In this institution we train organizations to become more efficient. We completely give our intellectual property or our store away. We open up our systems, processes, how we charge the patients, our records. DE SAM LAZARO: It’s the ethos set by his uncle. Dr. V, who was single, never took a salary. In fact, he mortgaged his home to start Aravind, and he also coaxed or inspired 34 members of his extended family to work here, starting in 1976 with his sister Natchiar and her husband. Both left surgical careers in America to work here for about $20 a month. Dr. G. NATCHIAR: Today, oh my God, we are very, very happy. In fact, at that time in ’80s we were not happy, even though Dr. V was happy. In the family, like me and my husband, two children, it was not easy for us. We could not even buy a cycle. At that time, we didn’t appreciate his far vision. Mr. ANGENEYULU: God bless you, Madam. Dr. NATCHIAR: God bless me? God bless the surgeon. DE SAM LAZARO: She says the satisfaction of seeing patients like Angeneyulu restored to full lives makes up for any material privation, although over the years salaries have greatly improved for the 220 doctors and some 2500 other Aravind staff. Mr. ANGENEYULU: My children are starting school on the first, so I want to get going. Dr. NATCHIAR: We’ll give you some dark glasses just like a Hollywood actor. DE SAM LAZARO: He’s one of 27 million patients who’ve been treated at Aravind and 3.4 million who’ve had surgery. Over the next 20 years the goal is to raise that number ten-fold. That’s a measure of how ambitious the Aravind people are. It’s also a measure of how many people remain blind in the world whose vision can easily be restored. For Religion & Ethics NewsWeekly, this is Fred de Sam Lazaro in Madurai, India.